Pet Dental examination’s primary benefit is the early detection of oral health and dental problems. Being aware of potential oral diseases can help our veterinarians find the most effective dental treatment for your pet. A proper dental care regimen led by timely dental examinations can prevent painful periodontal disease, inflamed gums, and tooth lost. Plaque and tartar, which can build up in your pet’s mouth without regular dental care, house bacteria, which attacks teeth, gums, and bones. Bacteria resulting from periodontal disease can affect the liver, kidneys, and heart by entering the bloodstream. Gingivitis can be painful, and can progress to periodontal disease, tooth loss or tooth abscesses. We also conduct dental examinations for puppies and kittens at our veterinary clinic in Kahului, or through our mobile veterinary service on Maui. The most common dental procedure we perform for young puppies and kittens is to ensure that the baby teeth are correctly replaced by adult teeth. Occasionally, tooth decay interferes with the correct arrangement of the adult teeth, creating crooked or broken teeth. Dental checkups are highly recommended for puppies and kittens, along with proper tooth brushing at home. Medical History Evaluation: All medical evaluations start with an examination of the patient’s medical history and records. Dental Problems and Symptoms Questionnaire: Our veterinarian will ask questions about symptoms of common dental problems that may indicate that your pet suffers from dental issues. Some of these symptoms are: bad breath, pawing at the mouth, loss of appetite, and excessive drooling. 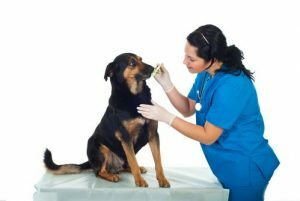 Bad Breath, Head and Neck Examination: your pet’s veterinarian will inspect your pet to see if there are any anomalies, including abscess, bad breath, swellings, lumps, inflamed lymph nodes, or pain. Thorough examination of teeth and gums: in our veterinary dentistry our veterinarian will examine your pet’s teeth and gums for gingivitis. Gingivitis causes the gums to show redness, bleeding, and inflammation. This can lead to accumulation of bacteria at the gum line. Damaged Teeth, Plaque and Tartar: During the dental exam, our veterinarian will inspect your pet for cracked or crooked teeth. Brushing your pet’s teeth daily removes plaque; however, if tartar is formed, the only way to remove it is professional veterinary dental cleaning. Detailed examination for oral cancers: At the time of the dental examination, our veterinarian will look for lumps or growths in your pet’s mouth. If our veterinarian detects any symptom of oral cancer, we will recommend a biopsy at our laboratory. When conducting a pet dental exam, there are parts of the procedure that can be performed without anesthesia. However, a full dental exam sometimes requires the use of sedation or anesthesia in order to be implemented in depth, especially when probing the gum line and spaces between the teeth for pockets. After the dental examination, your veterinarian may recommend that your pet receives a dental cleaning. Following a dental care program at home for your pets is a great way to keep your furry friend healthy. Making sure that your pet has regular dental exams helps us to evaluate the overall oral health of your pet, and to prevent future dental problems. Call our veterinary hospital in Kahului to book a dental examination at (808) 873-0102 or request an appointment through our website.